What Did Kong Hope To Achieve By Misleading CHC To Think They Would Own A Stadium? This year at the 2013 C3 Global Presence Conference, Kong Hee made the following comment. “I’ve learnt one thing about Pastor Phil: he’s a prophet of God. He’s very dangerous when he tells you that this building is created for you or built for you or developed for you. Because in 1995, he said the same thing to me. He said, “The SunTec Convention Center is- developed for you”. And then, I just checked a video a few years- uh, just recently, Pastor Phil. In the year 2000 I think. Or 2001. You spoke to our entire congregation. And you said, “You know what? You guys are going to SunTec Convention Center”. And so we did. And all the troubles began. So it’s all your fault, Pastor!” – Kong Hee, C3 Global Presence Conference, Day 1, Session 1, 2013. Kong has made it clear that Phil Pringle has been saying that he will own the SunTec Convention Center. So why did Kong Hee mislead his congregation into thinking CHC would be moving into stadiums? Why was he purposely deceiving people rather than stating to his congregation that he had in mind of owning the Convention Center? Here are some CHC members recalling a specific event where Kong Hee was misleading them into thinking they were going to moving into a future stadium. “All the figures revealed about the expenditures for “Crossover” project are mind blowing! What irks me is that Pastor Kong preached that the Arise and Build was for building God a great house, he showed pictures of huge stadiums even just prior to the point of announcing Suntec. And so we gave our best, our bonuses, our savings, our holidays. Now we hear from their own mouths that all the money went into the Crossover. We’ve been executive members for more than 10 years and this is the first time we hear about our BF money being used for other purposes. We had to hear it from the courts! To set the record straight, we never knew or even agreed for such use of the BF. We were all hoodwinked. We were all lied to. This is criminal. Since they have already admitted to using our BF in this manner, not for its original intended purpose, we are now considering a class action suit to get our money back plus damages. If Eng Han can get his all back, so should we. We don’t need to wait for the trail to be over. Anyone else with us? Any lawyers here to advise? Hahaha!!! Especially when Pastor showed us the pictures of all the photos… WOW! It is absolutely mind-boggling & faith-stretching… but at the same time, very exciting! 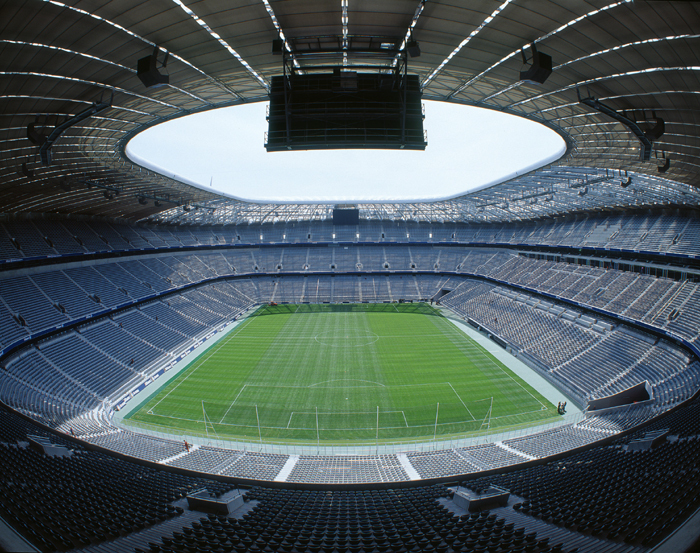 The Allianz Arena in Munich… Just look at the size of that! More Christians in his church should tell Phil Pringle to “stick to the bible”. The topic of money is a common message preached at C3 Church. While we do not hear the faithful gospel preached of Christ and Him crucified, it is impossible to escape C3’s ten minute money-grubbing message. People need to face the facts. Phil Pringle has an unhealthy obsession with money and making up fables. He clearly does not put his faith in God. Rather, Pringle puts faith in his works and finances. Question Pringle’s prosperity gospel and there is a good chance you will be labeled, criticised, ostracised, demonised or even isolated by the leadership. The tithe doctrine specifically is Pringle’s golden calf. In the past, the tithe has been called by C3 leadership the “foundation” or “cornerstone” to every believers life. This false doctrine is both binding and destructive. This keeps poor Christians in C3 stuck in their poverty. This false doctrine has divided families and churches. Still, Phil Pringle conveniently refuses to examine the historicity and the biblical truth of the tithe. This doctrine helps no one except the false and deceptive ministry of Phil Pringle. Yet he insists Christians must tithe. In a Sunday night sermon titled ‘Financial Excellence Part 2’ (22/05/2011), Phil Pringle slandered (blasphemed) God. He did so by putting words in God’s mouth. Pringle unashamedly went out of his way to mislead his congregation on his false tithe doctrine. Phil Pringle invented his own theology to convince and intimidate his congregation to continually financially support his ministry. Before you read and listen to this segment of Phil Pringle, we wish to warn you of following deceptive methods false teachers like himself use on Christians. WARNING 1: Always hold the pastor accountable to the words he uses. If he his playing with words, DO NOT LISTEN TO HIM. WARNING 2: If a pastor is wrongfully confusing what God is saying to what he is saying, DO NOT LISTEN TO HIM. WARNING 3: If a pastor does not read the biblical text to justify his claims, DO NOT LISTEN TO HIM. (i.e., if he tells you a biblical story and hi-jacks the biblical narrative for his own means.). WARNING 4: Always check what the pastor is saying in the NAME of God to what God actually says in His Word. WARNING 5: Always make sure that the Pastor is using biblical reasoning to teach you and NOT emotional manipulation (e.g., guilt, group intimidation). Below, Pringle breaks all the rules of how a pastor should teach, behave and rightly approach biblical texts. Throughout the below segment, Pringle kept redefining what the tithe was in very obscure ways. He does this to convince Christians that the tithe is biblical. Ask yourself: is the tithe continually defined by Pringle as ‘a tenth’ or something else? Does it keep changing itself meaning to suit Pringle’s theology or agenda? To actually grasp what Pringle is doing in this segment of teaching, please watch the video at the bottom of this article (one minute in). Good preachers clearly distinguish when God is speaking through the scriptures. They make sure that their voice is separate from God’s so no man is confused between a man’s words and God’s Word. Not so with Pringle. Pringle at one point speaks as though God is saying something through the scriptures. However, the listener can get easily confused over either God or Pringle speaking to you. Was Pringle telling us this or was he telling us this is what God was saying in the book of Joshua? Using the books of Genesis and Joshua, Pringle starts arguing his case for the tithe. He AVOIDS reading these texts to support his argument. Instead, Pringle hi-jacks the narrative, lies about God saying things He never said and makes stuff up according to his personal pet theories. Phil Pringle not only makes up his own theology in regards to the city of Jericho being a tithe, he also teaches that the Tree of Knowledge of Good and evil is the tithe. Once again, if anyone was reading Genesis 2-3, they would see that Pringle is not honest in handling the God’s Word. Below is part of the transcript we just critiqued and the video. “So here’s the Lord saying, “You’re robbing”. You’re taking something that belongs to God. It’s the tithe. You’re sticking it in your pocket. [Inaudible] Bless me. It aint gonna happen. There’s a guy called Achan in the scripture. And look- If I’m stirred up about anything to do with this message, it is this point I’m making right now. Because, here’s the thing, Achan- does anybody know who Achan is? Achan? Ok. Here’s the picture. Real quick little bible study. It’s the firstborn of every animal born on the earth. It’s the first. It’s the tithe. ‘kay. So everybody does it. “Phew! Don’t touch it! Don’t touch!” Achan sees a big lump of gold. He says, “I’ll take that”. Puts in his back pocket. Goes into his tent. Digs a hole. Puts it in. Hides it in a couple of garments. [Inaudible.] Digs a hole. Hides it. The next- they’re ready to go to the next town, Ai. Little town. A-i. That’s a little name, three thousand people, bam! Just go up there. Josh is- says ‘Oh, we wont even send the whole army up. We’ll kill these guys in no time at all’. Bam! So he goes up. They get defeated. He says, “What do you mean?” He says, “You gotta find out who did this.” So they find out. Do a little investigation. “Woah!” … This is why I’m stirred up about it. Because it’s not about just me individually. It’s about the whole church. I’ve a corporate responsibility to the entire Kingdom of God. To the whole body of Christ.” Phil Pringle, Ps Phil Pringle: Financial Excellence Part 2, http://www2.myc3church.net/videos/ps-phil-pringle-financial-excellence-part-2, Sermon (PM), 22/05/2011. Below you can watch him say this in the snippet about one minute in. Phil Pringle has a shepherds responsibility to handle God’s Word correctly and NOT lie and slander God and His word for financial gain. If anyone did do a “bible study” reading Joshua 6-8 while Pringle preached, they would notice Pringle made up things God never said. 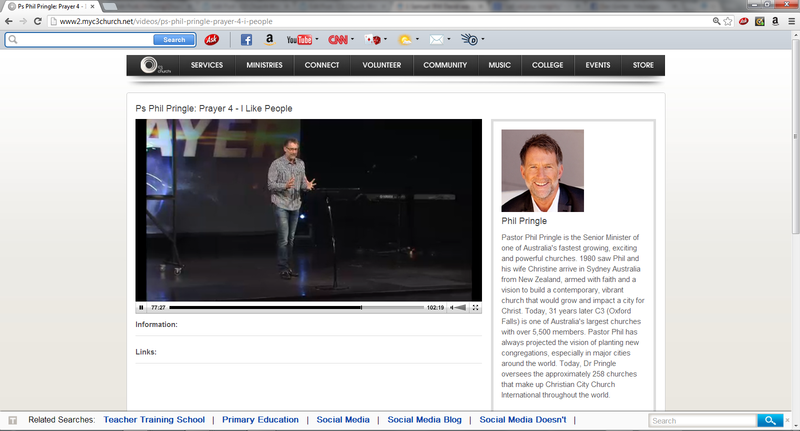 Phil Pringle is making God say and teach things God never said. In other words, Phil Pringle is blaspheming by taking the Lord’s name in vain. Firstly, this false teaching of the tithe goes against the heart of the Father, goes against Jesus and His finished work on Calvary and the Holy Spirit. Why? It is through Christ we find blessing and freedom away from the curse and condemnation of death, God’s Law and His wrath. As Christians we do not receive the Holy Spirit, God’s promise and blessing by our works. The entire letter to the Galatians makes this case. This is blasphemy no matter which way you look at it, again taking the Lord’s name in vain. Pringle lets his emotions run in this portion of his talk. His tone is accusative against Christians for not tithing. If you watch further beyond the transcript, he starts personally confessing his works and his faithfulness to the tithe. The onus is on non-tithers to do what Pringle says or else. His lies mixed with his intimidation is in our opinion bullying. It is of our opinion he is using misleading tactics to force non-tithers in his congregation to tithe, using his own congregation against them. Think of it this way. After this sermon, how would members react to people who say they don’t tithe? After this sermon, do you think non-tithers would dispute this teaching against other members? Do you think they will feel isolated and alone in their thoughts on this matter? Overall, this is a good example how a false teacher would teach and behave behind a pulpit. Phil Pringle’s false message and deceitful methods are clearly evident in this sermon. If you are still questioning if Kong Hee is a Word of Faith heretic, here is Kong at Presence Conference encouraging thousands of Christians to cast a “power of confession” on Steven Furtick to speak at City Harvest Church, Singapore. We would like to remind our readers that this is not a Christian practice and must NOT be practiced. Kong isn’t laughing. If you watch the clip, Kong is very determined to get Steven Furtick to speak at his church. The force is strong with the Kong. 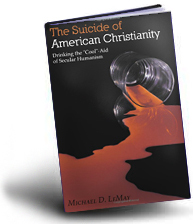 We may be looking at doing an article on this if there are any questions as to why this is not a Christian practice. When people critique Kong Hee’s Church they are also critiquing Phil Pringle and his church. We know personally that Kong Hee sees Phil Pringle in an infallible light as a personal master, mentor, pope and Prophet of God. Well actually we came here and copied everything from Christian City Church. So we have our own Rise and Build and I just thought I show you this latest installment where we anounced to our church, SunTec City Convention Center.” – Kong hee, C3 Presence Conference, Session 4, Sydney, 2010. Update: I have updated this analysis with a new article in the aftermath of the Pastor’s arrest. Although I am aware that City Harvest is one of the richest churches in Singapore, I am still shocked that it is rich enough to pay SGD310 million for a stake in Suntec City. Nevertheless, an entity which is able to amass such wealth is certainly worth studying. I was determined to understand the secrets to the church’s wealth. I apologize upfront if the points raised give offense to loyal followers of City Harvest Church. Please regard this article as a business analysis of the factors that contribute to the wealth of City Harvest Church, not as an insinuation that the Church got rich through questionable means. The fact is that CHC is very rich and this makes for a fascinating academic exercise to examine its sources of wealth. Just treat it as a business case study. I have tried my best to stick to the facts. Please correct me if there are factual mistakes. However, if there are differences in opinions, please disagree with courtesy. The income of a church is dependent on the tithes collected (10% of income from church-members). Therefore, the earning power of a church is highly dependent on its ability to retain its existing church members and attract new ones. The larger the church membership, the greater its earnings. I watched a sample of CHC weekend service on its website. Compared to the boring Sunday classes I attended as a kid, CHC church service was most refreshing (Watch “The 10 Laws Of The Harvest”). The beginning part resembles a rock concert with good singing and enthusiastic audience. It is an entertaining way to enjoy your Sunday mornings. Going to church becomes a weekly event to look forward to rather than a chore to attend to. With church services so well packaged for its customers, its customer retention rate and new customer acquisition figures should look good. This church is unlike the other churches I know. It generates extra revenue through advertisements during its Sunday service(watch the videos). It sells audio CDs on its website. There is an online shopping cart for convenience to those who want to buy online. Church-members can pay their tithe online via credit card, eNets or even Giro!! Once members started donating using Giro, the earnings quality of the church improves. Donation collected via Giro tend to be more stable. With a globalised economy, people travel round the world a lot and may miss Sunday services. In the past, the churches will lose income when these members fail to turn up to pay their tithe. Now, with online payment, they can continue collecting the tithe even when the church-member is working overseas for an extended period of time. With Giro, the church can continue collecting tithes for a few more months even when the member leaves the church as people have a habit of forgetting what they pay on Giro. 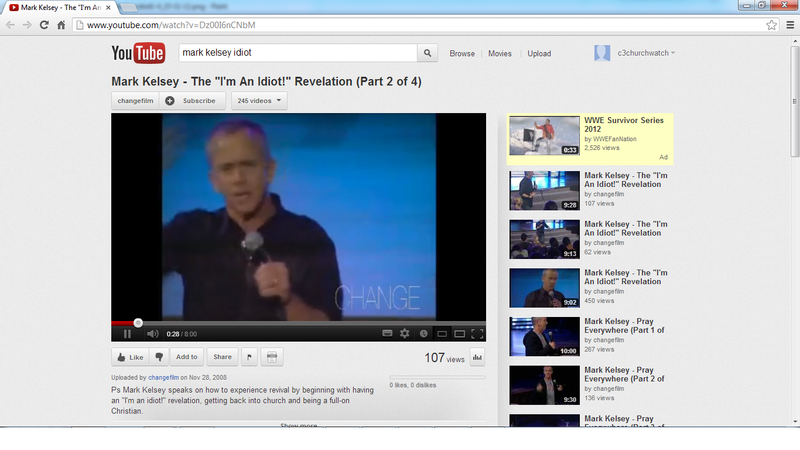 This is where the genius of CHC lies and the secret to its superior earning power. In fact, I have yet to encounter any public-listed company on SGX, HKSE, NYSE, Nasdaq that demonstrates better potential. The pastor preaches that God will give 30-fold, 60-fold, 100-fold returns on your tithe. But, you have to be generous in your donations first so that you will receive in harvest proportions. I guess that is the origin of the name City Harvest. 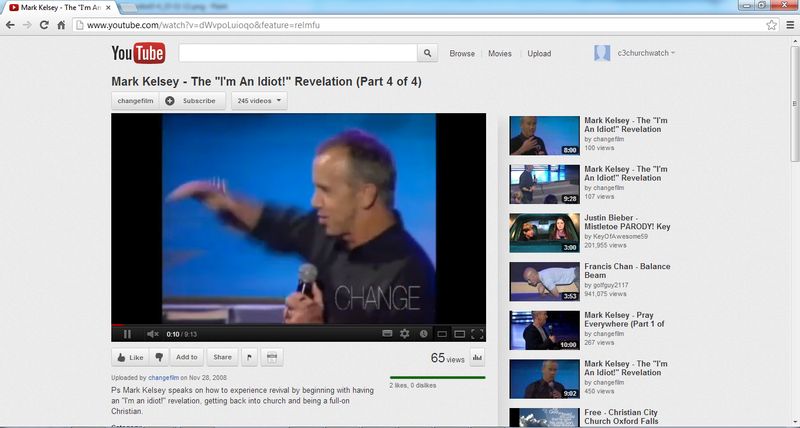 Please watch the video “The 10 Laws Of The Harvest” yourself in its entirety and interpret for yourself. 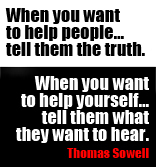 It is a message that cleverly uses an astute understanding of human nature to maximize profits. If I were a CHC member, I will be tempted to increase my tithe as much as possible. Not mincing my words, I am doing it out of pure greed. I do not think I will be alone. It is perfectly fine if members of CHC strongly disagree and thinks that I am not representative for most of them. After all, I can only speak for myself. With the 100-fold return message, the kind of church members attracted will be most conducive to profit-making. Money-minded people will be attracted to the church. These money-minded people tend to be ambitious and have a great desire to make lots of money. Millionaire minds have a higher chance to become rich. Hence, the quality of customers that CHC attracts are of the highest quality. 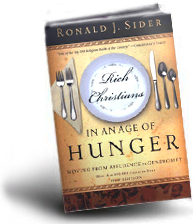 The richer the church-member, the higher is the church’s tithe per member. Customer quality will be enhanced through the passage of time due to survivor bias. Suppose out of this pool of Millionaire-Mind Christians, 50% become satisfactorily rich and the remaining 50% still unsatisfactorily middle-class. The 50% who got rich will donate even more because they think their source of wealth comes from their donations. It is most unlikely they will cut back on their tithes because they will be afraid God will punish them by cutting back the returns. If they are not afraid, the church will be there to warn them not to do so. 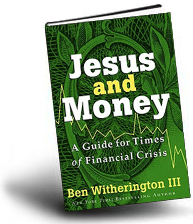 The remaining 50% who did not get rich will be disillusioned and probably leave the church. The loss is of little significance to the church. These people are not rich and their tithes will not amount to much. Many Christians will be disgusted with the concept of using tithes to get rich. These people will probably leave the church after attending a few Sunday services. Again, the loss is of little significance to CHC. These people will not be highly profitable to the church even if they are rich because they are not going to tithe as much as the others who believe their tithes is the way to wealth. To the credit of the Pastor, I think he has devised a wonderful process of filtering out non-profitable customers and sucking in the lucrative ones. There is only so much physical space that a church can have to service its church-members. To maximize profits, the church has to ensure that each unit of space is used for servicing lucrative customers. CHC has tremendous economic moat that kills off competition. In the video “The 10 Laws of The Harvest”, the Pastor cited Law #5 “Your Seed must be planted in Good Ground” which is an effective weapon in killing off his competition – the smaller churches. Many Christians feel that they ought to donate to the needy, smaller churches rather than rich mega-churches like CHC. The Pastor’s argument is that you do not get good returns like 100-fold in the small churches. You have to donate to mega-churches to maximize returns on your tithe because they have a track record (rich church members). In other words, the seed is not planted in good ground when you donate to the small churches. In his own words, “I don’t always give to the neediest but to the ground that will give the greatest yield”. To illustrate his point, he used an analogy on weak banks and strong banks. You do not deposit your money in a weak bank because it desperately needs fresh funds to survive. You deposit your money in a strong bank which invests your money wisely and yields good returns. The church has an iron-grip on its members who believe its message. As illustrated previously, its customer base is of the highest quality. This is its track record. Existing church-members will definitely not move to another smaller, needier church with poorer track record. It has a very strong economic moat as it is very hard for its competitors to get its customers to switch over. As the Pastor said, his church provides a good ground on which you can grow your riches. Rightly so, indeed. For property agents or insurance agents trying to hit their sales quota, City Harvest Church will be an ideal place to hunt for lucrative clients. This church concentrates several rich and money-minded people into a single location. The church offers a unique advantage to sell things. In a religious setting, people tend less to be on their guard and can be more easily persuaded to part with their money. Businessmen also like to network in places where there are rich and powerful people who will come in handy in future. The Pastor has done a good job in gathering such people in his church and it makes good sense to make use of this advantage by joining the church. The rich will attract more rich and the gathering moss snowballs to provide an ever-rising pool of donation to the church. 8. Preach what people like to hear. It seems like if I become rich, I will be condemned to hell. There is nothing more musical to a money-minded person than to hear that God is on your side in your pursuit of money. The church-members who are more money-minded will love this and donate even more. 9. God pays for the returns, not the church. The church collects the money, but God pays for the returns. The church does not need to pay a single cent for the 30-fold, 60-fold, 100-fold returns on the donations. This is as good as you do the work for me, but not only do I not pay you, I shall also collect your salary. You toil and sweat, but I shall eat your bread. God must surely be a miracle worker and people will pay handsomely for his service. I cannot think of a more advantageous economic position to be in to be able to collect money rendered by a miracle worker. If everyone around you donates, it is hard not to. When everyone else makes sacrifice, the one who does not will look like an outcast. There is tremendous pressure to conform in such a herd setting. Take a look at the congregation and you will notice the large number of young people. The income growth of young people is the fastest in the population. In the Pastor’s words, “You may be poor today, but you will not be poor all your life”. That is a long-term business plan in cultivating its customers. Therefore, if CHC can be viewed as a growth stock, its prospects are very bright as its young customers will accelerate its earnings. Besides being a growth stock, CHC can also be viewed as a defensive and safe stock. People pray hardest when they fall in hard times. Strangely, some people have an urge to tithe when they are in financial troubles. In fact, in the video (The 10 Laws Of The Harvest), a couple came on stage. They talked about the dire straits they were in when they started out. Things change when God challenged them to GIVE themselves out of poverty (exact words from the speaker). Despite not having any money, they still pledged $250 to the building fund. In his own words again, “we often emptied our savings to give to the House of God knowing that this will be the answer to our financial problems”. Hence, not only will the church earnings be stable in times of depression, it may even grow. The Pastor preaches Prosperity Gospel which revolves around money. His business genius lies in choosing this theme for his church. Money has universal appeal. Everyone worships money regardless of race, culture, age, gender, sexual orientation. In one fell swoop, he has enlarged his market to cover the entire world. It is much easier to convert people to your belief by dangling money and promising great prosperity. After all, who does not love money? By enlarging his potential market catchment with a greater chance of increasing membership, more donations will flow in. This creates a huge, unfair advantage compared to all other businesses. This is what landed CHC in controversy. Enough has been said. If one day the Pastor switches to become a businessman, I will definitely consider investing in the company that he heads and founds. If City Harvest Church is listed on the Singapore Stock Exchange, I will certainly buy it. It will be one stock that I am confident of hitting a return of 30-fold, 60-fold, 100-fold returns. PS: People tend not to question critically when it comes to religion. A charming smooth talker can easily sway minds with his interpretation of the Bible. In the final analysis, Faith is about simply believing. You cannot approach it scientifically because there is no way to test religious theories using the scientific method. We will only know the real truth when judgment day comes. The danger is that there is no accountability on the part of the preacher on whether his teachings are true or not. Even he himself cannot be sure that his interpretations is 100% correct. Given human nature, the interpretations will tend to be self-serving. In fact, it is not only dangerous to the students but to the teacher as well. People will believe their own lies if it yields tempting benefits. That was how Wall Street drank its own Kool-Aid. While I respect the Pastor for his business savvy, I cannot agree with his interpretations of the Bible. I pray for good health, peace and harmony for my family. Money-minded as I am, I am not comfortable with commercializing my relationship with God by asking for money. The Christian God that I know from my own reading of the Bible is not 财神爷. Of course, if God wants to drop money from heaven on me, I will be more than happy to embrace it. In the below quote, Pringle narcigetes 2 Samuel 30:6 to justify, explain and warn his congregation on some peculiar things. It is clear in his use of the text he seems to somehow see himself as a ‘king’ over his church and within the offline or online communities. To clarify, the New Testament does NOT teach that a pastor is a king, nor is Phil Pringle Jesus or Moses. If you have been reading the various articles on Phil Pringle here, it should be pretty clear he is clearly a false teacher and a false prophet. It is this type of person Jesus warns us against in Matthew 7. In this article, we reveal Pringle provides some interesting information in a sermon he gave in 2011. Pringle teaches that people in his church may “get wounded” and experience “distress” and “grief”. If it was the world persecuting the church that is understandable. However, Pringle provides the context of his warning. He says Christians in his movement could experience with other Christians (in or outside his movement) traumatic experiences that may test their loyalty to him and his movement. If it’s gossip this is understandable. However, once again – the point of controversy within the framework of his teaching evolved around him. Which leads to our next point. Pringle reveals he has been approached by people who have said that they will “go to the newspaper”. He emphasises that he has heard people say this “many times” to him. 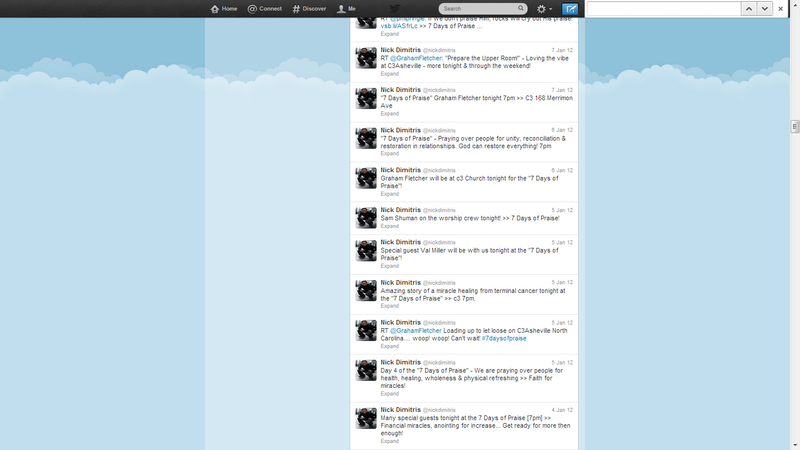 This tells us that people HAVE expressed their concerns to him and he has rejected them, their reports or corrections. The result being, people have seemingly stated to Pringle they will “go to the newspaper” because issues were not personally resolved with Pringle. Pringle alerts us to the fact he is aware what people are saying on Facebook and blogging communities about him and his movement. 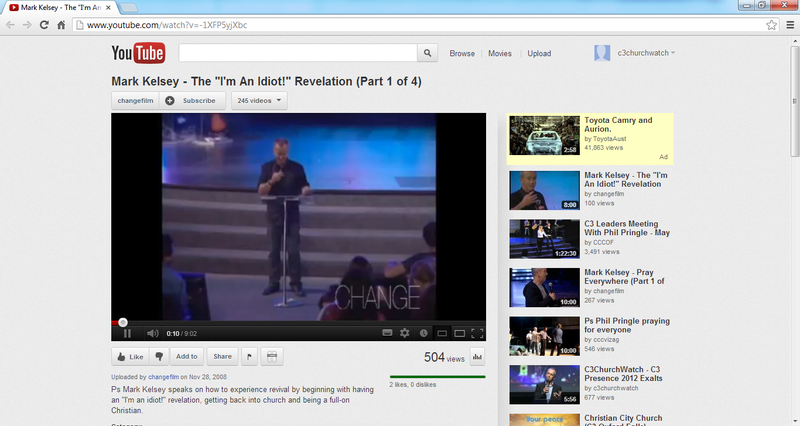 In June 2011, MyC3ChurchReview (MC3CR) was established around the time C3ChurchWatch started up. It is possible that Pringle may have been referring to the manager of the MC3CR site who also started a twitter account with about three followers. In spite of what is being said online regarding his teaching or practices, he has shown that he would rather mock them or ‘stone them’. This only goes to show Pringle refuses to be corrected or deal with certain false doctrines, his false gospel, scandals within his movement, bad behaviour or false methodologies. Argh! Golly! How many times I heard that? “I’m gonna get all the press down there and yuhyuhgruhyuh!” You think it doesn’t happen? There may even be a day when you’re tempted to think that because something happened when you want out to battle and family members or friends or yourself- you get wounded and you’re in such distress, such grief- that’s the moment where there’s deep loyalty tests. And you find those moments in life! Everybody does! “I’m gonna Facebook them! Obladyuhyuhyuh!! !” “You wont like any of this on my blog baby! Iya-blurdludludludludle!!! Blog away!” Everybody can have a shot of being heard! I’m gonna tell the whole world, “You’ve got three followers on Twitter!” – Phil Pringle, Ps Phil Pringle: Prayer 4 – I Like People, http://www2.myc3church.net/videos/ps-phil-pringle-prayer-4-i-people, 77:01, C3 Oxford Falls, Sunday Night Service, 25/09/2011. There is one last thing to consider. Don’t you think it’s odd that Pringle implies that he’ll only listen to you depending on how big your following is on twitter? What other standard must a Christian uphold so that Phil Pringle might listen to their concerns and act on them? We’ll end with Mark Dever talking addressing the faulty ‘church growth’ standard and application that ministers like Pringle adhere too. PP’s Potty-Mouth Preaching On Monism? Christian Witness Ministries reports Phil Pringle teaching the following. The Question being: “What do you think is under this sheep clothing-? PP then describes how Jesus wants to clean up certain areas, and focuses on the toilet. PP “Jesus came to ‘clean us up’ “. PP further describes how Jesus wants to clean certain areas of our lives that are ‘messed up’. PP “He wants to clean up the brown smears on the bowl”. Then in reference to the atmosphere (in the toilet) PP continues on. PP goes on to describe the power of God as ‘stuff’. 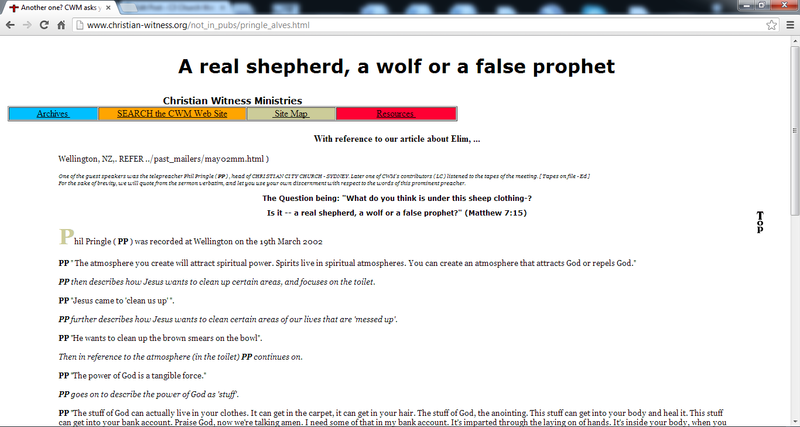 Source: A real shepherd, a wolf or a false prophet, Christian Witness Ministries, http://www.christian-witness.org/not_in_pubs/pringle_alves.html, Last revised-Friday, November 10, 2006. Accessed 07/02/2013. “Monism is the view that reality consists of one fundamental, ultimate essence. It comes from the Greek mono, which means one. All is one. Therefore, in monism God and the universe are the same thing. This would mean that energy, motion, matter, thought, consciousness, etc., are all of one substance but are perceived differently. Monism stands in opposition to the dualism and pluralism but is often defined the same as pantheism, the teaching that God and the universe are the same thing. Source: What is monism?, Christian Apologetics & Research Ministry, http://carm.org/questions/about-philosophy/what-monism,. Accessed 07/02/2013. NOTE: SCREEN GRAB TAKEN ON 08/02/2013. Jesus often labeled the Pharisees of his days as false teachers and false prophets. He also called them hypocrites. In the greek, a hypocrite was someone who was an actor. 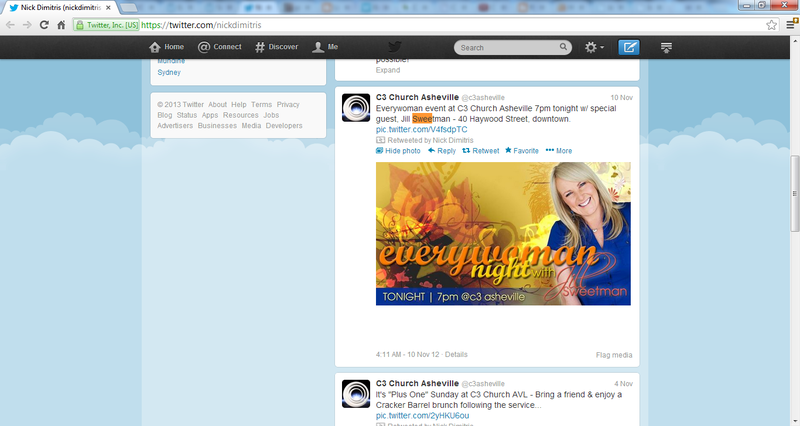 What we’ve seen in the C3 Asheville scandal is show after show, starring the US C3 Leadership. If Nick Dimitris is still the Pastor of C3 Asheville one has to ask the question: Why is Jill Sweetman allowing Dimitris to remain a C3 Pastor and speaking at his Everywoman Conference? From what we’re seeing, the Sweetman’s have no problem allowing C3 Pastor Nick Dimitris pull the wool over his congregations eyes after the FDIC (Federal Deposit Insurance Corp) accused him of bank fraud. In fact, they further endorse him by speaking at his conferences. In the tweets, Dimitris is expecting that “financial miracles”, “anointing for increase”, “unity, reconciliation & restoration in relationships” happen and “provision, resource & blessing” occur in his 7 Days of Praise event. Yet what has Dimitris done to fix the people he financially exploited in his congregation? What has he done to fix the division, bitterness and hurt he caused in his skulduggery? Why didn’t the Sweetman’s step in and prevent this smokescreen praise event from occuring? Why are the Sweetman’s speaking at Dimitris’ conferences and not dealing with their C3 Asheville Pastor for committing bank fraud? What makes this behaviour disturbing by Dimitris and the Sweetman’s was that the FDIC accused C3 Church Pastor Dimitris of bank fraud less then a month ago when the 7 Day of Praise event was put on. The below public record (stamped 05/12/2011), shows Dimitris pleading guilty under oath to conspiracy to commit bank fraud. “Did willfully embezzle, abstract, purloin and willfully misapply any of the moneys, funds, or credits of Pisgah Community Bank, in that you did procure and obtain as a straw borrower a series of straw borrower loans and that you recruited other persons to obtain straw borrower loans”. “… willfully became a member of that conspiracy”. Nick Dimitris responded to the following questions. “Are you in fact guilty of the count in the bill of information to which you have come to court today to plead guilty? That is, did you commit the act(s) described in count one of the bill of information? “Is your plea of guilty voluntary and not the result of coercion, threats or promises other that those contained in the written plea agreement? Sentencing has not happened in this case yet. Dimitris offers some revealing information about his “education”. Does Beacon University sound familiar? Oddly enough, our previous investigation into Dale Bronner revealed that the US courts exposed Beacon University (Christian Life ) to be a diploma mill and agreed in court to “refund tuition” and no longer award degrees. This would explain why Dimitris said he has enough credits for a Bachelor Degree in Theology. This is a really sad thing to see in the C3 Churches of America. Please pray that the situation over in Asheville is resolved. C3 Church Watch will keep you posted as to whether the United States of America sentences this C3 pastor to prison or not. Is The C3 Movement A “Cult Of Prosperity”? Phil Pringle is heavily influenced by the prosperity cults. He endorses, speaks or works alongside some of the most heretical persons such as Kenneth and Gloria Copeland, Joel Osteen, Benny Hinn, Joyce Meyer, Brian Houston, Yonngi Cho, Kong Hee, Kenneth Hagin, John Avanzini, Pat Robertson, Oral Roberts, John Maxwell, Rick Warren, Dale Bronner, Bill Johnson, T.D Jakes, Tommy Tenney and so on. The article below addresses false teachers who Pringle either endorses or who is influenced by their ministries. The below article uproots Pringle’s false Christianity and does a solid job presenting readers with the facts of scripture. Unlike Pringle, we encourage readers to pull out their bibles (or visit our resources on the left) to do a bible study on this article below. Teachers of the prosperity gospel encourage their followers to pray, and even demand, of God “everything from modes of transportation (cars, vans, trucks, even two-seat planes), [to] homes, furniture, and large bank accounts.”5 By closely examining the faulty theology and errant biblical interpretation of the teachers of this movement, this study will prove that the prosperity gospel teachings regarding the acquisition and accumulation of wealth are ethically incorrect. 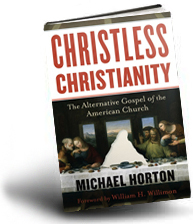 “Theology is important,” wrote scholar Millard J. Erickson, “because correct doctrinal beliefs are essential to the relationship between the believer and God.”6 A corollary to this statement is that an incorrect theology will lead to incorrect beliefs about God, His Word, and His dealings with men. The thesis of this paper is that the prosperity gospel is constructed upon a faulty theology. Consequently, many of its doctrines, including the teachings concerning wealth, are erroneous. 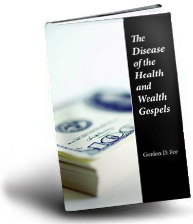 While it is beyond the scope of this study to examine in detail all of the specific doctrines of prosperity theology, there are four crucial areas of error relating to their teachings on wealth that may be isolated and examined. These areas are the Abrahamic covenant, the Atonement, giving, and faith. Researcher Edward Pousson best stated the prosperity view on the application of the Abrahamic covenant when he wrote, “Christians are Abraham’s spiritual children and heirs to the blessings of faith…. This Abrahamic inheritance is unpacked primarily in terms of material entitlements.”9 In other words, according to the prosperity gospel, the primary purpose of the Abrahamic covenant was for God to bless Abraham materially. Since believers are now “Abraham’s spiritual children,” they consequently have inherited these financial blessings of the covenant. Prosperity teacher Kenneth Copeland wrote, “Since God’s Covenant has been established and prosperity is a provision of this covenant, you need to realize that prosperity belongs to you now!”10 Referring to the prosperity theology of Kenneth Hagin, author Harvey Cox wrote, “Through the crucifixion of Christ, Christians have inherited all the promises made to Abraham, and these include both spiritual and material well-being.”11 To support this claim, prosperity teachers such as Copeland and Hagin appeal to Gal. 3:14, which says “that the blessings of Abraham might come upon the Gentiles in Christ Jesus. . . .”12 While it is not an understatement to say that the problems with this argument are legion, two glaring problems need to be addressed. First, in their appeal to Gal. 3:14, prosperity teachers ignore the second half of the verse, which reads, “That we might receive the promise of the Spirit through faith.”13 In this verse Paul clearly was reminding the Galatians of the spiritual blessing of salvation, not the material blessing of wealth. Second, prosperity teachers claim that the conduit through which believers receive Abraham’s blessings is faith. This completely ignores the orthodox understanding that the Abrahamic covenant was an unconditional covenant.14 That is, the blessings of the Abrahamic covenant were not contingent upon one man’s obedience. Therefore, even if the Abrahamic covenant did apply to Christians, all believers would already be experiencing the material blessings regardless of prosperity theology. A second cracked pillar upon which prosperity theology stands is that of a faulty view of the Atonement. Theologian Ken Sarles wrote that “the prosperity gospel claims that both physical healing and financial prosperity have been provided for in the Atonement.”15 This seems to be an accurate observation in light of teacher Kenneth Copeland’s comment that “the basic principle of the Christian life is to know that God put our sin, sickness, disease, sorrow, grief, and poverty on Jesus at Calvary.”16 This misunderstanding of the Atonement stems from two errors that proponents of the prosperity gospel make. First, many who hold to prosperity theology have a fundamental misconception of the life of Christ. For example, teacher John Avanzini proclaimed that “Jesus had a nice house, a big house,”17 “Jesus was handling big money,”18 and He even “wore designer clothes.”19 It is easy to see how such a warped view of the life of Christ could lead to an equally warped misconception of the death of Christ. A second error of prosperity theology, which also leads to a faulty view of the Atonement, is the misinterpretation of 2 Cor. 8:9. Without exception, this is the verse to which prosperity teachers appeal in order to support their view of the Atonement. The verse reads, “For you know the grace of our Lord Jesus Christ, that though He was rich, yet for your sakes He became poor, that you through His poverty might become rich.”20 This problem with this interpretation is, of course, that in this verse Paul was in no way teaching that Christ died on the cross for the purpose of increasing anyone’s net worth materially. In fact, Paul was actually teaching the exact opposite principle. Contextually, it is clear that Paul was teaching the Corinthians that since Christ accomplished so much for them through the Atonement, then how much more ought they empty themselves of their riches in service of the Savior. This is why just five short verses later Paul would urge the Corinthians to give their wealth away to their needy brothers, writing “that now at this time your abundance may supply their lack.”21 Commentator Philip E. Hughes wrote of 2 Cor. 8:9, “The logic implicit in the statement of this great truth is too obvious for anyone to miss it.”22 Apparently, however, the champions of the prosperity gospel have indeed missed it. One of the most striking characteristics of the prosperity theologians is their seeming fixation with the act of giving. Students of the prosperity gospel are urged to give generously and are confronted with such pious statements as, “True prosperity is the ability to use God’s power to meet the needs of mankind in any realm of life,”23 and, “We have been called to finance the gospel to the world.”24 While at face value these statements do indeed appear to be praiseworthy, a closer examination of the theology behind them reveals that the prosperity gospel’s emphasis on giving is built on anything but philanthropic motives. The driving force behind this emphasis on giving is what teacher Robert Tilton referred to as the “Law of Compensation.”25 According to this law, which is supposedly based on Mark 10:30,26 Christians need to give generously to others because when they do, God gives back more in return. This, in turn, leads to a cycle of ever-increasing prosperity. A final area of prosperity theology that merits investigation is that of the doctrine of faith. Whereas orthodox Christianity understands faith to be “trust in the person of Jesus Christ, the truth of His teaching, and the redemptive work He accomplished at Calvary,”30 prosperity teachers espouse quite a different doctrine. In his book, The Laws of Prosperity, Kenneth Copeland wrote that “faith is a spiritual force, a spiritual energy, a spiritual power. It is this force of faith which makes the laws of the spirit world function. . . . There are certain laws governing prosperity revealed in God’s Word. Faith causes them to function.”31 This is obviously a faulty, if not heretical, understanding of faith. Later in the same book Copeland wrote that “if you make up your mind . . . that you are willing to live in divine prosperity and abundance, . . . divine prosperity will come to pass in your life. You have exercised your faith.”32 According to prosperity theology, faith is not a theocentric act of the will, or simply trust in God; rather it is an anthropocentric spiritual force, directed at God. Indeed, any theology that views faith solely as a means to material gain rather than the acceptance of heavenly justification must be judged as faulty and inadequate. As has already been demonstrated in this paper, the hermeneutics of the prosperity movement leaves much to be desired. Author Ken Sarles wrote of the prosperity teachers that their “method of interpreting the biblical text is highly subjective and arbitrary. Bible verses are quoted in abundance without attention to grammatical indicators, semantic nuances, or literary and historical context. The result is a set of ideas and principles based on distortion of textual meaning.”33 Indeed, a survey of the volumes of literature produced by the prosperity teachers yields numerous examples of such misinterpretations. 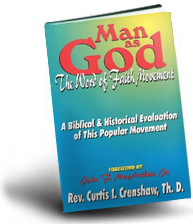 As was the case in the theological study of this movement, an analysis of all such examples of misinterpreted texts would fall beyond the scope of this study. 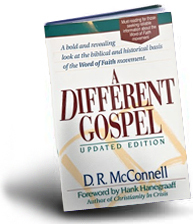 However, it is possible to choose one verse as an example and to examine both the prosperity gospel and orthodox interpretations of the text. Another faith teacher who has built his ministry around this faulty interpretation of 3 John 2 is Kenneth Copeland. Author Kenneth Kantzer noted that “Copeland misinterprets this [verse] as a universal promise,”37 and writer Bruce Barron remarked that “the Copelands use these words so often that they appear to be the key verse of their ministry.”38 A careful study of 3 John 2, however, reveals that this verse is not a carte blanche approval of prosperity gospel teachings. Those who use 3 John 2 to support the prosperity gospel are committing two crucial errors, the first contextual and the second grammatical. First, con-textually, one is wise to note that John’s purpose in writing 3 John 2 was not to teach doctrine; it was simply to open his letter with a greeting. This is not to say that doctrine cannot be derived from a nondoctrinal passage, for all Scripture is profitable for doctrine, but it is to say that one must be sensitive to the original author’s intent. Therefore, the claim that 3 John 2 teaches the doctrine of prosperity ought to be regarded as suspect at best. Second, one is wise to note the meaning of the word “prosperity” as it occurs in this verse. The term translated “prosperity” is a form of the Greek word eujodovw. This word, which is used only four times in Scripture, does not mean to prosper in the sense of “gaining material possessions,” but rather means “to grant a prosperous expedition and expeditious journey,” or “to lead by a direct and easy way.”39 The wording of modern translations such as the New International Version even reflect this nuance of the word.40 Therefore it is evident that teachers who understand 3 John 2 to teach prosperity theology are misinterpreting the text. 1. The prosperity gospel is built upon a faulty understanding of the Abrahamic covenant. 2. The prosperity gospel is built upon a faulty understanding of the Atonement. 3. The prosperity gospel is based upon a faulty understanding of the biblical tachings on giving. 4. The prosperity gospel is based upon a faulty understanding of the biblical teachings on faith. 5. The prosperity gospel, in general, has been constructed upon faulty biblical interpretation. Aside from these five specific theological and biblical arguments against the prosperity gospel, and without even considering the practical implications of this movement,41 there is perhaps one general, summary reason why the prosperity gospel is a wayward gospel: its faulty view of the relationship between God and man. Simply put, if the prosperity gospel is correct, grace becomes obsolete, God becomes irrelevant, and man is the measure of all things. Whether it is the Abrahamic covenant, the Atonement, giving, faith, or the biblical interpretation of any given verse, the prosperity teacher seeks to turn the relationship between God and man into a financial quid pro quo transaction. As scholar James R. Goff noted, God is “reduced to a kind of ‘cosmic bellhop’ attending to the needs and desires of his creation.”42 This is a wholly inadequate and unbiblical view of the relationship between God and man and the stewardship of wealth. Note: This article was originally published in Faith and Mission Vol 16, p. 79ff. Published with permission. 1 Tom Carted, ed., 2,200 Quotations from the Writings of Charles H. Spurgeon (Grand Rapids: Baker Book House, 1988), 216. 2 While it is impossible to trace the prosperity gospel back to an exact starting point, there are at least three movements from which it draws its ideas. One is the experience-centered Christianity which was birthed in the mind of nineteenth-century theologian Friedrich Schleiermacher and has come to fruition in the form of the twentieth-century Charismatic movement. A second philosophy that gave rise to the prosperity gospel was the “positive thinking” school of Norman Vincent Peale. Indeed, scholar Harvey Cox wrote concerning the prosperity gospel that “it owed much to the ‘positive thinking’ of the late Norman Vincent Peale.” Harvey Cox, Fire from Heaven (Reading, MA: Addison-Wesley, 1995), 272. The third modern movement that has influenced the prosperity gospel is simply the “American dream,” or materialism. 3 For the purpose of this paper, the phrase “prosperity gospel” will be used. 4 Robert Tilton, God’s Word about Prosperity (Dallas, TX: Word of Faith Publications, 1983), 6. 5 David Pilgrim, “Egoism or Altruism: A Social Psychological Critique of the Prosperity Gospel of Televangelist Robert Tilton,” Journal of Religious Studies, 18.1-2 (1992): 3. 6 Millard J. Erickson, Christian Theology (Grand Rapids, MI: Baker Book House, 1985), 28. 7 This important covenant is mentioned numerous times in the writings of the prosperity teachers, i.e., Gloria Copeland, God’s Willis Prosperity (Fort Worth, TX: Kenneth Copeland Publications, 1973), 4-6; Kenneth Copeland, The Laws of Prosperity (Fort Worth, TX: Kenneth Copeland Publications, 1974), 51; idem, Our Covenant with God (Fort Worth, TX: Kenneth Copeland Publications, 1987), 10; Edward Pousson, Spreading the Flame (Grand Rapids, MI: Zondervan, 1992), 158; and Kenneth Copeland, The Troublemaker (Fort Worth, TX: Kenneth Copeland Publications, n.d.), 6. 8 Prosperity teacher Kenneth Copeland articulated his movement’s view of the inception of the Abrahamic covenant best when he wrote that “after Adam’s fall in the Garden, God needed an avenue back into the earth;… since man was the key figure in the Fall, man had to be the key figure in the redemption, so God approached a man named Abram. He reenacted with Abram what Satan had done with Adam. . . . God offered Abram a proposition and Abram bought it.” Kenneth Copeland, Our Covenant with God, 10. 10 Kenneth Copeland, The Laws of Prosperity, 51. 14 That the Abrahamic covenant is an unconditional covenant can be demonstrated by four facts. First, the covenant ceremony in Genesis 15 was unilateral. In fact, Abraham was asleep. Second, no conditions are stated in the covenant. Third, in the restatement of the covenant in Gen. 17:7,13, and 19, the covenant is called “everlasting.” Finally, the covenant was confirmed despite Abraham’s continued disobedience and lack of faith. 15 Ken L. Sarles, “A Theological Evaluation of the Prosperity Gospel,” Bibliotheca Sacra 143 (Oct.-Dec. 1986): 339. 16 Kenneth Copeland, The Troublemaker, 6. 17 John Avanzini, “Believer’s Voice of Victory,” program on TBN, 20 January 1991. 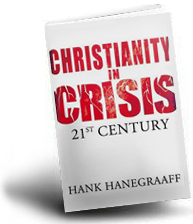 Quoted in Hank Hanegraaff, Christianity in Crisis (Eugene, OR: Harvest House, 1993), 381. 18 Idem, “Praise the Lord,” program on TBN, 15 September 1988. Quoted in Hanegraaff, 381. 20 2 Cor. 8:9 (NKJV). 21 2 Cor. 8:14 (NKJV). 22 Philip E. Hughes, The Second Epistle to the Corinthians, New International Commentary on the New Testament (Grand Rapids, MI: Eerdmans Publishers, 1962), 300. 23 Kenneth Copeland, The Laws of Prosperity, 26. 24 Gloria Copeland, God’s Will Is Prosperity, 45. 25 Theologian Ken Sarles rightly noted that “the Law of Compensation [is] the bedrock of the prosperity movement.” Sarles, 349. 26 In Mark 10:29-30, Jesus stated, “Assuredly, I say to you, there is no one who has left house or brothers or sister or father or mother or wife or children or lands, for My sake and the gospel’s who shall not receive a hundredfold now in this time—houses and brothers and sisters and mothers and children and lands, with persecutions—and in the age to come, eternal life” (NKJV). Other verses that the “Law of Compensation” is based upon include Eccl. 11:1, 2 Cor. 9:6, and Gal. 6:7. 31 Kenneth Copeland, The Laws of Prosperity, 19. 34 Sarles says that this is an “often quoted verse” in the prosperity movement. Sarles, 338. 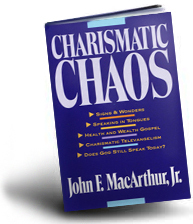 Hanegraaff wrote that 3 John 2 was a “classic example” of prosperity misinterpretation. Hanegraaff, 223. Gordon Fee called 3 John 2 “the basic Scripture text of the cult of prosperity.” Gordon Fee, “The ‘Gospel’ of Prosperity,” Reformation Today 82 (Nov.-Dec. 1984): 40. Bruce Barron wrote that 3 John 2 was “the ‘Old Faithful’ of prosperity proof texts.” Bruce Barron, The Health and Wealth Gospel (Downers Grove, IL: Inter Varsity Press, 1987), 91. 35 3 John 2 (NKJV). 36 For a full account of Roberts’ miraculous revelation concerning 3 John 2, see Barron, 62. 37 Kenneth S. Kantzer, “The Cut-Rate Grace of a Health and Wealth Gospel,” Christianity Today, vol. 29, June 1985, 14. 40 “Dear Friend, I pray that you may enjoy good health and that all may go well with you, even as your soul is getting along well” (3 John 2, NIV). 41 There are numerous practical implications that arise from the prosperity gospel view on wealth. While it would take a lengthy treatise to explore and explain them all, three are important enough to be considered here. First, the prosperity gospel incorrectly implies that poverty is a sin. Teacher Robert Tilton even said that “being poor is a sin.” Robert Tilton, “Success in Life,” program on TBN, 27 December 1990, quoted in Hanegraaff, 186. Likewise, Kenneth Copeland wrote that “poverty is under the curse of the Law.” Copeland, Laws of Success, 51. Second, the prosperity gospel “appeals to the poor and the sick to put more faith in the ultimate fulfillment of their desires than in the Word of God.” Sarles, 343. Third, when the prosperity gospel does cause positive changes in a believer’s life, the prosperity teacher gets most of the credit, and when the believer does not experience prosperity, the blame is usually left upon that individual. For example, Robert Tilton offered several reasons why some believers did not experience blessings: “Individuals lacked faith, refused to follow his directions, and criticized Tilton’s ministry.” Pilgrim, 7. 42 James R. Goff, Jr., “The Faith That Claims,” Christianity Today, vol. 34, February 1990,21. Source: David Jones, The Bankruptcy of the Prosperity Gospel: An Exercise in Biblical and Theological Ethics, http://bible.org/article/bankruptcy-prosperity-gospel-exercise-biblical-and-theological-ethics, Accessed 09/01/2013. Note: C3ChurchWatch has permission to published this article.